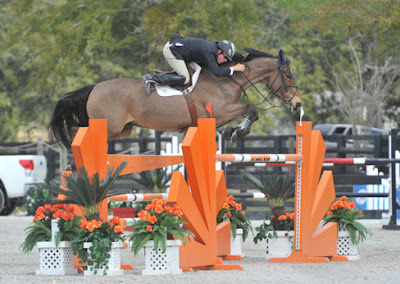 David Beisel and Always Cullohill on course in the $25,000 SmartPak Grand Prix, presented by Pfizer Animal Health. OCALA, FL (February 25, 2011)--It was another beautiful day at HITS Post Time Farm in Ocala, Florida as David Beisel and Always Cullohill, a 16 year-old Irish Sport Horse, owned by Harlow Investment Enterprises, LLC, took home the win in Thursday’s $25,000 SmartPak Grand Prix, presented by Pfizer Animal Health. Beisel, of Goshen, Ohio, was one of 31 riders to take the field on a course designed by Jose “Pepe” Gamarra of Ellenton, Florida, who is enjoying his first season building at HITS Ocala. Originally from La Paz, Bolivia, Gamarra has a celebrated career as a course designer and has traveled the world building for some of the most prestigious events in the sport. He was an Assistant Course Designer at the 2004 Olympic Games in Athens, at the 2008 Olympic Games in Hong Kong, and at the Pan American Games when they were held in the Dominican Republic and Argentina. Starting the jump-off and setting the Great American Time to Beat was Patty Stovel of Chester Springs, Pennsylvania and her own Carigor Z, in 31.960 seconds. Three trips later, Beisel stole the lead by a fraction of a second with a time of 31.725 seconds, pushing Stovel into second place. “I really didn’t feel fast enough in the jump off round,” admitted Beisel, who’s only been showing Always Cullohill for a month. 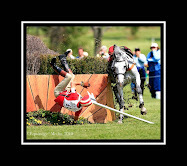 “I held him back a bit in order to keep him careful, but he has such a big stride that he really covers the ground. I am still getting used to the horse, so it was great to finish up with the win." Last to show in the jump-off was Harold Chopping and Penelope Strait & Jenna Hoy's Little Glen’s Valentino, who finished with a double-clear effort in a nail-biting 31.970 seconds, just one one-hundredth of a second off Stovel’s time, to finish in third place. Rounding out the top of the class were Canada’s Francois Lamontagne aboard his own Anton in fourth place, and Tracey Fenney of Flower Mound, Texas, aboard MTM Farm’s MTM Centano in fifth place. Brandie Holloway of Topeka, Kansas finished in sixth place aboard Hays Investment Corp.’s Argentina. 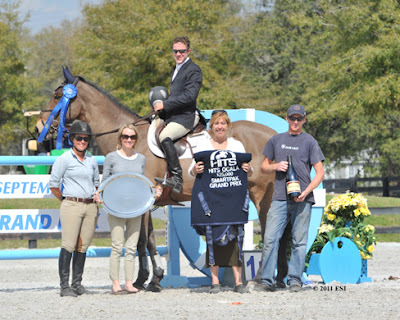 HITS' Lisa Engel presented the awards, a cooler courtesy of Shires Equestrian Products, and a bottle of chardonnay courtesy of Sonoma-Cutrer™ Wines, to David Beisel and Always Cullohill in the $25,000 SmartPak Grand Prix, presented by Pfizer Animal Health. Beisel was joined the winner's circle by Hanna Holmes, wife Paige Beisel, and Sean Fitzpatrick, who helped present the awards. For Beisel, HITS Ocala is home for the whole family. Beisel enjoyed his first Grand Prix win of the season with his wife, Paige, and children, Cooper and Isabelle, there to watch. The entire family competes at HITS Ocala; Paige shows in the Adult Hunters while Cooper and Isabelle have been active winning ribbons in the Beginner and Advanced Beginner Equitation divisions. Derek Petersen of Archer, Florida and his own Eli won the $2,500 Brook Ledge Open Welcome on Wednesday. The class featured 31 competitors, as Matthias Hollberg of Apex, North Carolina, took second aboard Apex Equestrian Center’s Aragon II and the Sanctuary Reserve Award, compliments of The Sanctuary. Finishing in third place was Colombia’s Roberto Teran and Karley Hopwood’s Passion. Derek Petersen and his own Eli on course in Wednesday's $2,500 Brook Ledge Open Welcome at HITS Post Time Farm in Ocala, Florida. 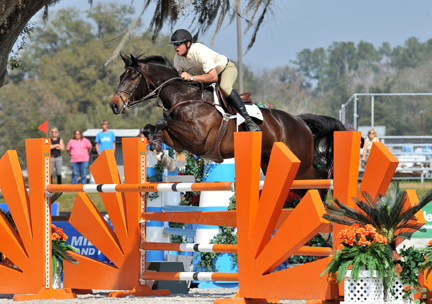 The Ocala Masters continues through the weekend and will feature several exciting events, including the $15,000 Marshall & Sterling Children's/Adult Jumper Classic on Saturday night under the lights in the Grand Prix ring. All are welcome to experience the Overlook Club as Cody's Original Roadhouse, an official HITS VIP Restaurant, will be serving up their “simply good food” starting at 6pm to exhibitors watching all the action. Highlighting the week on Sunday will be the $5,000 Devoucoux Hunter Prix, the $10,000 Junior Hunter Classic, and the $50,000 Strongid C 2X Grand Prix, presented by Pfizer Animal Health. 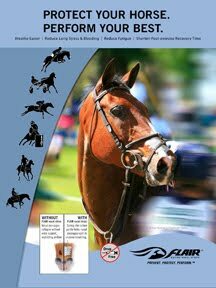 All Grand Prix and Devoucoux Hunter Prix events this season are qualifiers for the 2011 Pfizer $1 Million Grand Prix and inaugural Diamond Mills $500,000 3'3" Hunter Prix Final, respectively, which will take place September 10-11 at HITS-on-the-Hudson in Saugerties, New York.